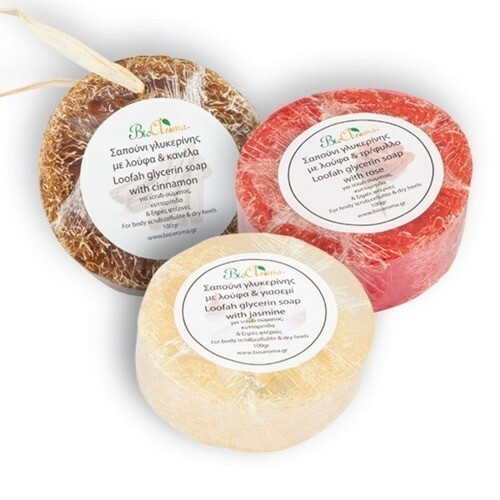 BioAroma Glycerin Seife mit Luffa und den ätherischen Ölen von Zimt 100% Natur - der beste Naturkosmetik erhältlich auf der Webseite www.ETERNEL.pl in Kategorie BioAroma Kräuter-Kosmetik für die Körperpflege. Wir empfehlen! 100% natural soap with cinnamon oil. Sunk inside loofah provides a natural scrub, so effectively cleanses your body, exfoliates the skin, results in better blood circulation and skin cell renewal. Sie sparen 17% (1,17 EUR). Natural, glycerin, handmade soap made by traditional "cold" method with the addition of precious cinnamon oil. Glycerin is one of the products of the reaction of saponification of natural vegetable oils. Thanks to the traditional manufacturing process, in BioAroma soaps preserved all valuable components of vegetable oils. The soap has loofah sunken inside, it is an interesting plant obtained from the tropics. Dry stems of loofah are perfect as natural scrub. Thanks to this, soap helps cleanse effectively your skin - the epidermis peels well, to results at the same time in better blood circulation and skin cell renewal. This action allows the skin endowment desired smoothness, flexibility, and allows nutrients contained in the soap to penetrate effectively into the skin. Soap care is irreplaceable in the fight against cellulite and stretch marks! Contained in the soap essential cinnamon oil warms senses, nourishes the skin, smoothes and improves its elasticity. Soap perfectly softens and moisturizes even the most sensitive skin. Wash gently the whole body, replacing previously used gels, liquid soaps, lotions. Does not contain artificial colours, preservatives or fragrances. Environmentally friendly - 100% biodegradable. Dampen the appropriate parts of the body and use the soap until getting soft foam. Massage gently providing natural peeling effect. Then rinse thoroughly with water.